Most of the blockhouses in Canada were built, to a greater or lesser extent, as barracks for troops. But the large blockhouses built in 1796 at Fort George and Amherstburg, and in 1797 at Fort St. Joseph, are unique in one sense: the peculiar course of events determined that the entire garrison and most of the stores were lodged in a single blockhouse of a stockaded fort. These forts are excellent examples of the temporary and expedient measures adopted by the British in times of peace, which proved completely inadequate in wartime when cedar pickets and musket-proof blockhouses were no match for the frontier war in the making. These three forts spelled the end of the viability of stockaded works on the Great Lakes system. Each of them was, appropriately, destroyed in the War of 1812. Fort George was burned to the ground by heated shot from American guns; Fort Amherstburg was burned by the retreating British; Fort St. Joseph was abandoned by the British and burned by the Americans. By the provisions of Jay's Treaty (1794) which finally settled the boundary dispute in North America, Great Britain promised to withdraw her regular forces from the western posts within two years. The withdrawal of these troops to British territory meant the establishment of three new frontier posts: Fort George on the Niagara frontier; Fort Amherstburg at the mouth of the Detroit River, and Fort St. Joseph on St. Joseph Island in Lake Huron. Because the treaty had settled the outstanding point of contention between Great Britain and the United States, a long period of peace was expected. Consequently Parliament was not inclined to spend a great deal of money to establish strong frontier defences. The three posts which were built were designed principally to be inexpensive, temporary, defensible storehouses and barracks. Political and commercial considerations outweighed those of the military. The forts had to be maintained and garrisoned to provide a rendezvous for the Indians, and a mechanism for the distribution of gifts and supplies to them which would, Britain hoped, assure the necessary alliances against the eventuality of another war with the United States. The posts were also maintained in order to protect and control the fur trade. The three original large blockhouses were all built from a single plan prepared by Gother Mann, the Commanding Royal Engineer in Canada.2 They were large enough to contain immediately those stores which had to be put under cover. The blockhouses measured 96 feet by 26 feet in the lower storey and 100 feet by 30 feet in the upper. The upper storey, because it was used as a barracks, was loopholed for rifle fire. 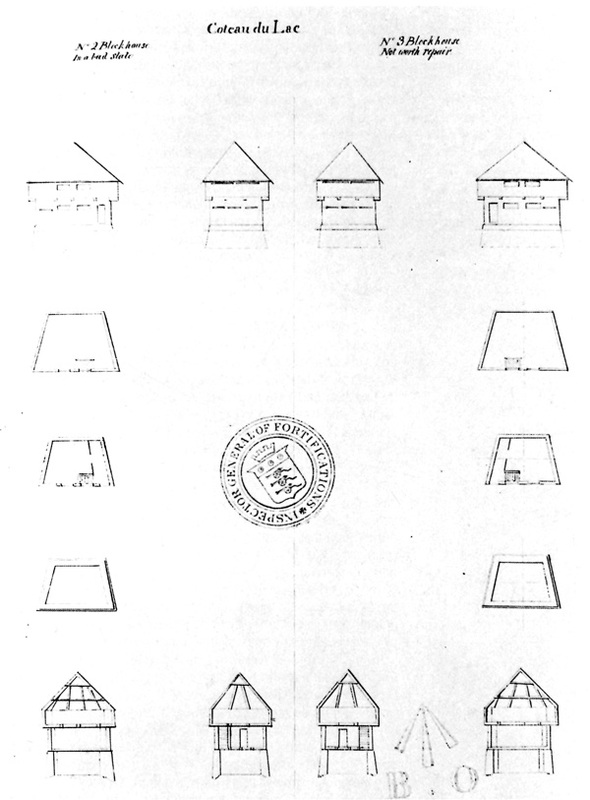 The sequence in the establishment of the forts was the same in all three cases: large blockhouses were erected in 1796 to accommodate the troops and necessary stores, followed closely by the erection of magazines to keep powder dry and of picketing to prevent stealing and to define the work. Finally, over a period of years, each fort grew slowly and found its own level, determining which buildings were necessary to allow the proper functioning of each department. 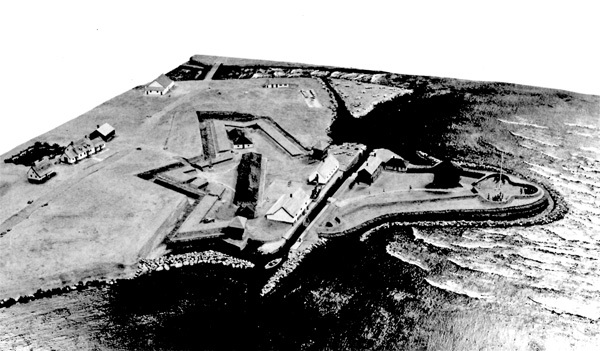 The position was recaptured by the British in December of 1813, and the fort was partially rebuilt. They also captured the American Fort Niagara. With Fort George partly rebuilt, Fort Niagara in their hands and the beginnings made on a fort at Mississauga Point, the British were assured of control of the mouth of the Niagara River for the remainder of the war. After the peace treaty, Fort George was gradually allowed to fall into ruin, and the main British efforts for defence were transferred to the more strategic Mississauga Point. 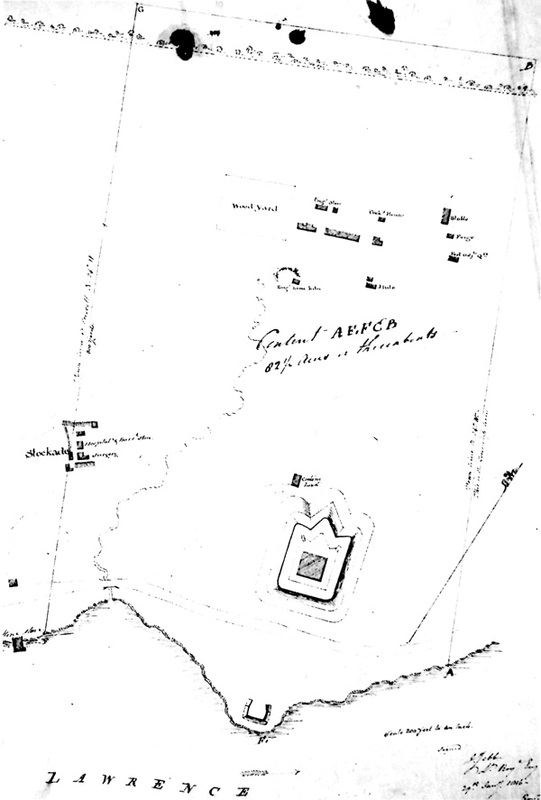 The fort at Amherstburg9 (alternatively called Fort Malden) was begun in 1796. The site, which was chosen as a replacement for Detroit, was at the western entrance of the Detroit River into Lake Erie. The fort was located opposite Ile Bois Blanc, thereby commanding the eastern channel of the river which passed inside the island. This channel was the main shipping route, and had to be used by all but the smallest boats. After the American assault on York in May 1813 and the destruction of Fort George a few weeks later, the post at Amherstburg was all but cut off from reinforcements and supplies. With the American fleet under Commodore Perry completely in control of Lake Erie, it was only a matter of time before the fort at Amherstburg would have to be abandoned. In the face of a naval blockade by Perry and the threat of a land assault by General William Henry Harrison, Major Henry Proctor, commanding at Amherstburg, ordered a retreat on 26 September 1813. Before they left, the soldiers destroyed the barracks, shipyards and remaining fortifications.11 Proctor's retreating army was defeated at Moraviantown mission on 5 October 1813. Although the Americans rebuilt the fort during their occupation of it, and the British continued their restoration after the peace was signed, there is no further evidence that blockhouses were ever again constructed in the fort. Fort St. Joseph12 replaced Michilimackinac in 1797 as the most westerly of the British fortified posts. The fort was 1,500 miles from Quebec by the St. Lawrence-Great Lakes route. The situation chosen for the new fort was on a small promontory of St. Joseph Island at the entrance to the St. Marys River. The fort was intended to be the general rendezvous for the Indians and fur traders of the area. A large blockhouse, similar to those at Fort George and Amherstburg, was begun first. Lieutenant Lacy of the Royal Engineers, supplied with a plan by Gother Mann, was sent in the spring of 1797 to superintend the erection of the blockhouse. 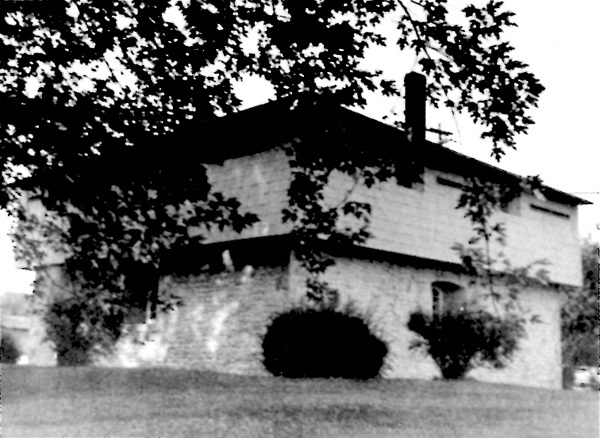 Captain Peter Drummond, in command at the island, was instructed to begin preparing materials for the blockhouse pending Lacy's arrival.13 The blockhouse was begun that summer, but for lack of materials could not be completed the first year.14 Lieutenant George Landman, R.E., was ordered to St. Joseph the next spring to complete the blockhouse and to begin other works on the site.15 Landman supervised the construction of the fort until it was completed in 1800. 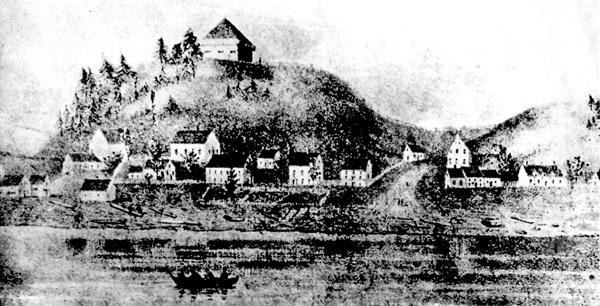 Captain Bruyeres reported to Prescott in August 1811 that the fort was "in bad disrepair and incapable of any defence. "17 Captain Charles Roberts, who commanded at St. Joseph when war was declared in 1812, was of the same opinion. Rather than risk defeat on the island, Roberts determined to take offensive action; accordingly on 16 July 1812, he led his small detachment and a band of Indians in a successful attack on Michilimackinac. Because of Michilimackinac's superior strength and position, the British were able to maintain the post throughout the war. The fort on St. Joseph Island remained unoccupied, and was burnt to the ground by an American force raised against Michilimackinac. The fort at St. Joseph was never rebuilt.18 The British began fortifying Drummond Island in Lake Huron after the war. When that island was awarded to the Americans, the British retired to Penetanguishene.